So far this holiday season, I’ve avoided the shopping mall madness. Thank god for online ordering. The one type of in-person shopping I wouldn’t have minded doing is flea market shopping. 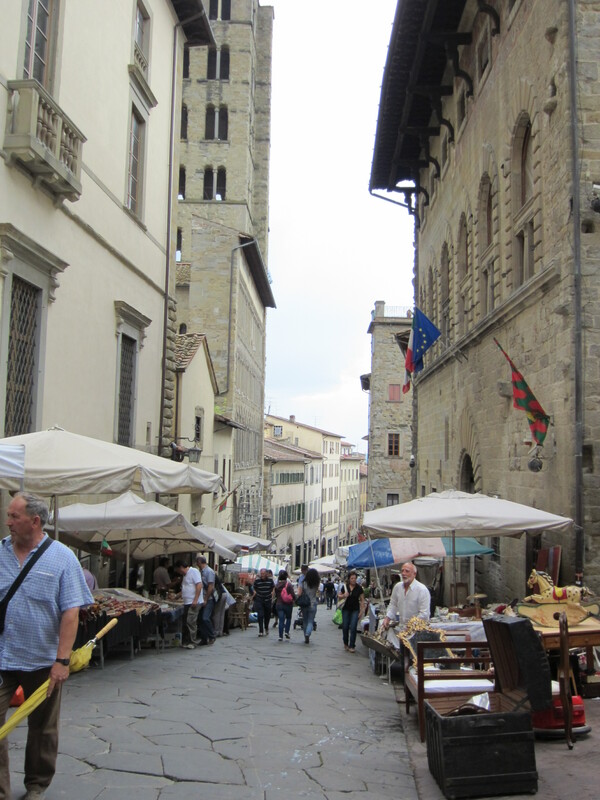 How I wish there is something like the antiques market in Arezzo, Italy here at home. Of course, even if there was a way for vendors to haul over antiques several hundreds of years old over here, we would still be lacking medieval walls, Renaissance architecture and Roman ruins. 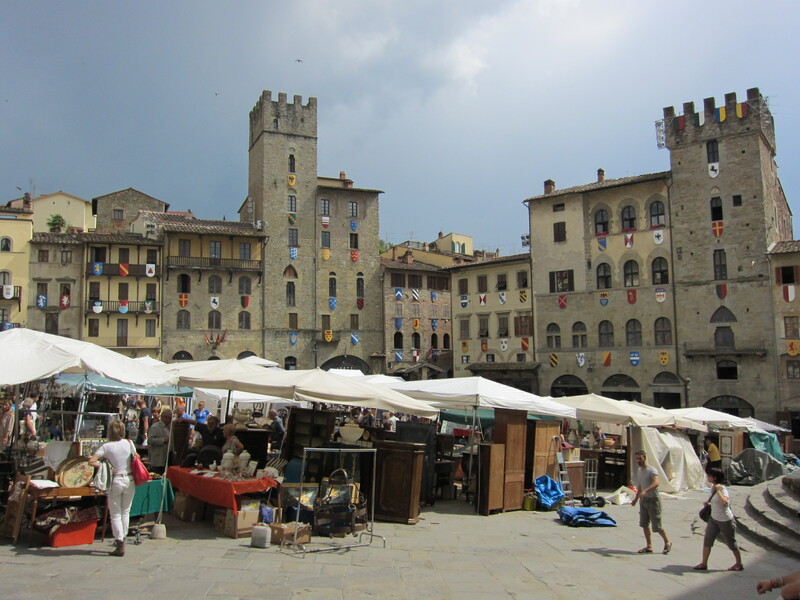 Arezzo is just one of the many charming cities dotting the Tuscan landscape. 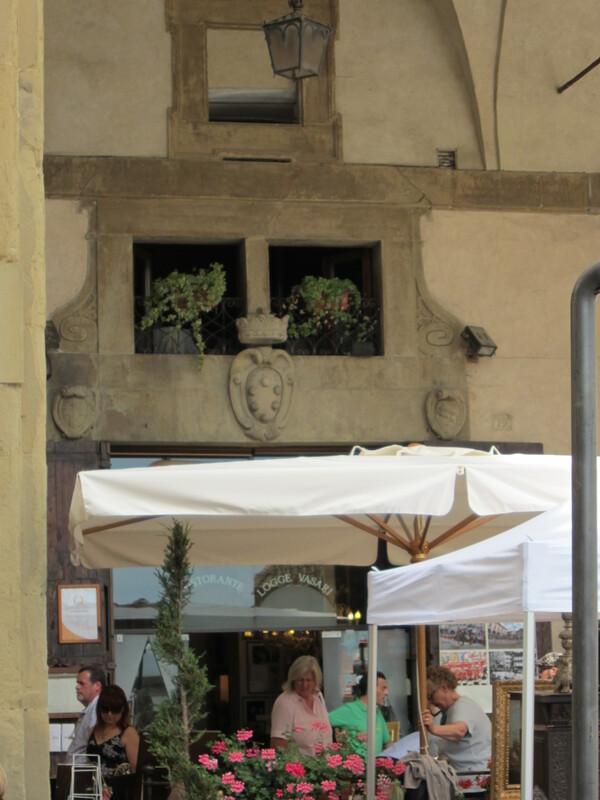 We dropped by the town for a few hours, simply because it was on the route between Sienna and our agriturismo. One of the benefits of not planning your travel itinerary to a tee is the feeling of surprise when you stumble upon something completely unexpected. 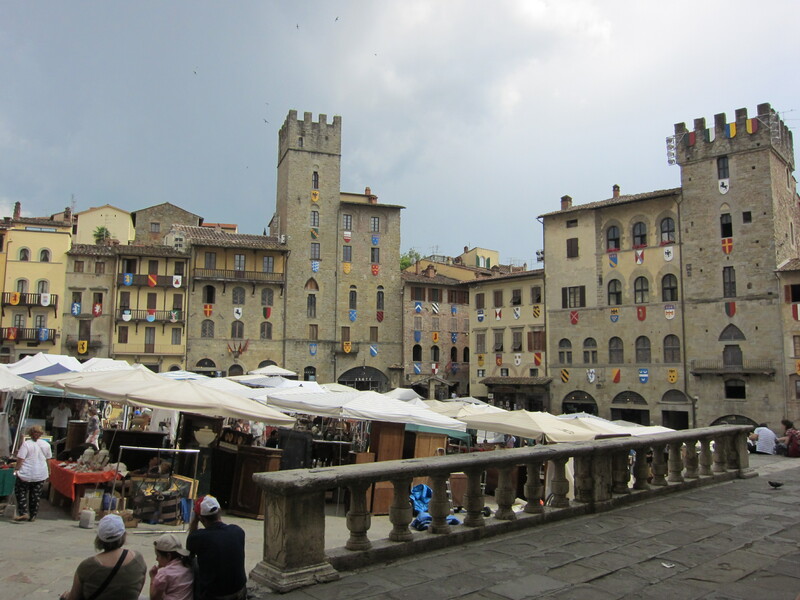 As we walked through Arezzo’s pedestrian-only streets and alleys to Piazza Grande, its main plaza, the sky above threatened to dump rain upon us. The antiques stalls begin even before you get to the plaza, which helps make it Italy’s largest, as well as oldest, antiques fair. We were extremely lucky to stumble upon this, as it only takes place the first Sunday of the month and the Saturday before. Don’t you just love the buildings with its colorful flags everywhere. A true celebration of the past! Surrounding the plazas are many cafes and restaurants with which you can take a break from your treasure hunting. We hid in one when a thunderstorm graced us with its presence for a short while. Sadly I do not have a grand Tuscan retreat or Venetian mansion to furnish. I did linger a bit at one of the many tables with beautiful jewelry. Even though I didn’t leave with anything, it was fun to discuss with Hubby what we would buy if we had a nice little bed and breakfast. I love these markets! There is an excellent one in Lucca every month and a small, but very interesting market in Forte Dei Marmi which I get to whenever I can. Oooooh well need to remember Lucca for next time I go!